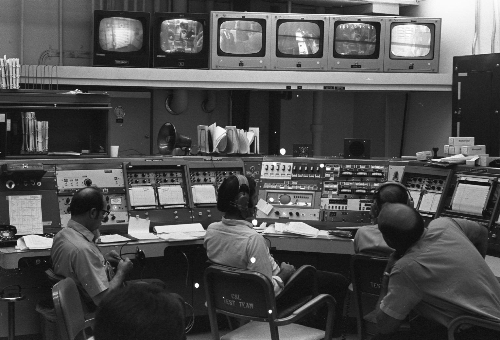 This photo centers on the Test Director console in the control room. 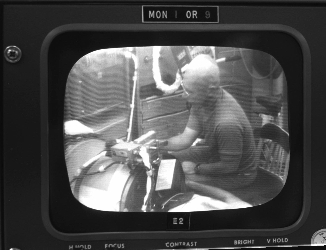 Closed-circuit TV displays provide a view of activities inside the chamber. The TD console has meter and paper chart displays of critical test parameters, communications system controls, and the Emergency Control Systems Panel. All the functions required to counteract emergencies were actuated by single emergency switches for 'Fire', 'Smoke', 'Emergency Repressurization, and others. 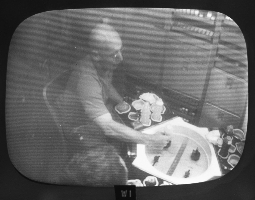 More instrumentation displays and controls were located in the consoles to the right of the TD console. One of the medical experiments involved a Lower Body Negative Pressure Device or LBNPD. The subject slips his lower body into the cylinder of the device and a slight vacuum is applied. This causes the blood to move to the lower body in a manner similar to the effect of standing in 1-G. An instrument inside the LBNPD measured thigh size to determine loss of conditioning of the vascular system and muscles of the legs during exposure to Zero-G. Too much vacuum could cause fainting, just as standing suddenly after prolonged bed rest can. This was a flight-like pedestal to which the food trays could be attached. Water dispensers were provided for reconstituting food. The food trays had solid-state thermal-electic heaters and coolers to warm or cool the food. Power for the trays came through the pedestal. The moire patterns on these images are the result of the overlay of the scanner raster pattern with the TV raster pattern in the original negative. 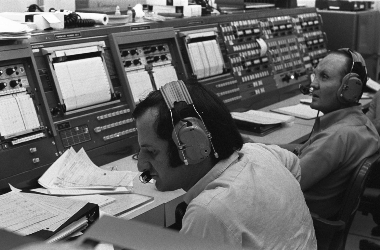 The Skylab Exercyle had a programmable load and the crewman wore sensors to obtain heart function, pulse rate, and other biomedical parameters during exercise. 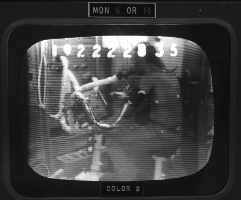 The exercycle had to be replaced once during the test.